The baby ghosts from the second installment of The Helium Books series create havoc that leads to a party. After getting themselves sprayed by a skunk, the baby ghosts bathe in tomato juice to remove the odor. And because they still smell, they are sent to sleep near the donkeys – their next victims – whose hoofs are to be trimmed the next day. Independent book review publication BlueInk Review recently reviewed “Helium Heels.” It found the story to be unique and imaginative, but also scattered and wanting of improvement. BlueInk Review’s verdict: “Helium Heels” delivers an unapologetically original story that never quite takes off. 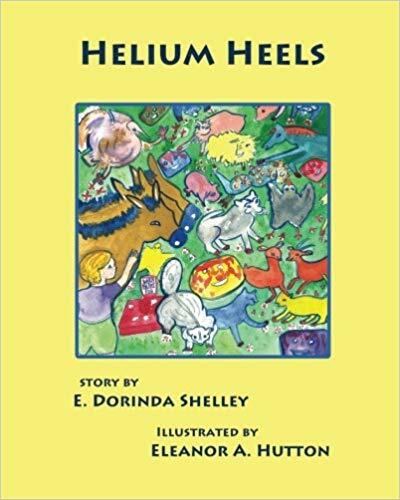 Order E. Dorinda Shelley’s “Helium Heels” today through Amazon and Barnes & Noble. Dr. E. Dorinda Shelley is a retired dermatologist. She grew up in Missouri, spending weekends on a farm with friendly horses. She, her husband, and three children lived for many years on a “farmette” in NW Ohio, surrounded by many of the animals in this story. This is the third in a series of books she has written and Eleanor Hutton has illustrated.